Hey kids! There's so much to do during Merry Christmas - gorge on yummy dishes, party with friends and family, adorn your home and lawn with Christmas tree, sparkling lights and ornaments. And it is also the time to make some splendid crafts for your loved ones. Here we bring some fantastic DIY craft ideas and videos for all you little creative geniuses. 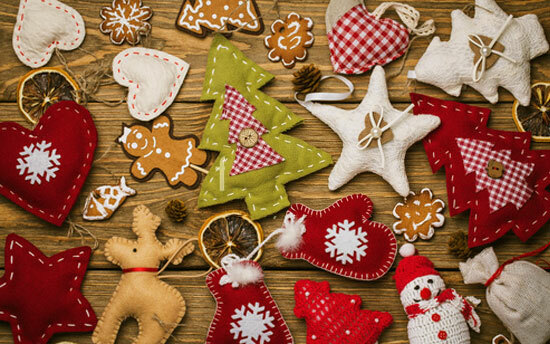 These Christmas craft ideas are fit to make the festival celebrations even more fun for you as well as your loved ones. If you like our craft ideas, use these to make wonderful Christmas crafts for your dear ones and please click here to send this page to all your pals. Share these cool Christmas craft tips with everyone you know. Enjoy a merry Christmas with your family and near ones. Merry Christmas! 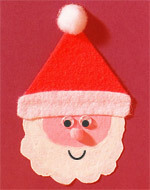 Try these free craft ideas and make a variety of crafts on Christmas with simple materials. Make Christmas even more special this year by creating wonderful gifts for your loved ones all by yourself! 1) Ready-made sugar paste fondant icing (in assorted colours). 2) Ready-to-pipe confectioners' frosting (in assorted colours). Applying kitchen knife, cut different shapes out of the sugar paste fondant icing. 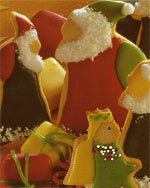 Using picture as a reference, stick the shapes in place with confectioners' frosting. Pipe confectioners' frosting over the shapes to form lines and dots in various colours. Use dragees to decorate the figures as shown. Add desiccated coconut for Santa's beard. 2) Wrapping paper (of different colours). Cut out several similar shaped strips (7" x 1") from the papers. Try to get a balance of different colours. Pour some glue on the end of one strip. Press the opposite end of the strip over the glued end to make a loop. Press together and blow air into the join to dry glue. Pass the next strip through the loop in the previous manner and glue together like before. Continue the process until you have created a long chain. 3) Small and medium sized potatoes. 5) Pen (to shape potato stamp). 6) Sharp knife (to shape potato stamp). 13) White bobble (for hat). 14) Pink bobble (for nose). Cut the paper. Fold it to fit into your envelope. Use the sharp knife to slice small potato in half, to make it of the same size as Santa's face. Dip the potato slices in pink paint. Press it just below the card center to form a pink impression. Slice the medium potato from the middle into two pieces. Use the scissors to cut a beard-shaped stamp. Dip this in white paint and press it in the lower half of the face. Cut out a hat shape from the red felt to fit the Santa head. Cut a strip out of the white felt to stick on the lower part of the hat as an edge. Using glue, stick on plastic eyes and the bobbles in place. Draw a smile to make a pleasing Santa face. 1) Cardboard - 1 small piece. 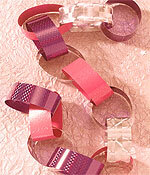 3) A narrow ribbon strip (to hang). 5) Coloured paper - 1 small piece. 6) A pair of scissors. 1) Styrofoam balls - 2 (1 small piece for the head and 1 bigger piece for the body). 3) White tissue paper - 1 sheet. 6) 2 small plastic eyes. 7) Black beads - 6 (for mouth). 8) Purple sequins - 2 (for buttons). 9) Steel crochet hook - 1 (1.75 mm). Using scissors, cut out a triangular strip (5" high by 4½" wide base) from the cardboard. Form a wide green ribbon strip into a loop and glue at the base of the triangle to form a trunk. Stick ribbon across the bottom tier. Clean-cut the excess to give a neat appearance. Repeat the process with different ribbons, overlapping each tier. Finish with paper at the top. Repeat the process on the reverse side. Make a hole in the top using the hole puncher. Pass the narrow ribbon strip through and tie into a loop to hang the tree. Tear the tissue paper into small strips. Mix glue with water in a bowl. Soak the tissue strips in it. Mould tissue around each styrofoam ball. Roll a carrot nose from tissue. Mould it onto the head and allow time to dry. Insert crochet hook through the bigger styrofoam ball. Pull through an 8" long silver thread loop. Insert the crochet hook through head from top and pull through the thread loop from the body. Adjust to create a thread loop (5' long) at the top. Hold it in place at the base of the body with a large knot. Colour the nose with orange paint. Using glue, stick eyes, beads and sequins to the head and body as shown in the picture. You have finished creating your snowman. Hang it from anywhere you like. 4) Crayons or markers (optional). 1) Draw a star shape on a piece of stiff paper and cut it out. This will be your template. Using it, trace and cut out another star shape from the stiff paper you have. 2) Decorate the two stars (as you want) on both sides and cut them out. 3) Make one long narrow cut from an inner corner to the center point of one star shape. On the other star, make a cut of similar length, but from the outer corner to the center point. 4) Pass one star through the slit of another. Tape the stars a bit where they meet at the slits. You will have a beautiful three-dimensional star decoration that stands by itself on any flat surface. 13) Cups - 2 (one small sized & one large sized). 1) Take the green poster board and put on a flat surface. Using the plates, draw circles of two different sizes on the board. Cut out the circles and glue the spruce sprigs onto one side of each, to cover the surfaces completely. 2) Take the yellow poster board and draw twelve small circles on it using the small sized cup as a guideline. Also draw one large circle on it with the large sized cup. Draw and cut twelve stars out of the coloured paper. Then place one star on each circle and place one piece of candy on each star and glue to the large spruce covered green circle surface. 3) Using the yarn needle, make a hole in each yellow card circle. Thread the yarn through each hole and tie in a pretty bow. Make a hole at the top of the green circle and pull a piece of red yarn through the top hole to make a hanger. Your Candy Wreath is ready to be used. 1) Paint your old hair clips with colored nail polish (you can paint them in a single color or use various nail polishes to paint them in various colors). 2) Allow the nail polish to dry and paint some more glitter polish over top for added effect. You can put a coat of clear nail polish over this afterwards and let dry. In the absence of any glitter nail polish, you can sprinkle craft sparkles or glitter over the colored nail polish while it is still wet. 3) Take a piece of the fishing line and tie on it some tiny light bulbs with the string you have. Slip the fishing line through the hole on the end of the hair clip. Tie securely at each end. Your Christmas Hair Clips are ready. Wear these cute clips in your hair and get stylish this Christmas Eve!. Note: If you find the light bulbs falling out of their socket, glue them back into place with the help of someone elder using the Super Glue. 2) Transparent craft beads (of 5 to 10 mm diameters). 1. Bend one end of the pipe cleaner into a 90-degree angle. Weave the beads from the other end, stopping half an inch from the tip. 2. Twist the two ends together, and the strand is ready to shape into a star, a candy cane, or another festive object. To make the strand a longer one, use two pipe cleaners and twist their ends together. Also needed: Construction paper (of other colors), glue, hole punch and stickers. 1) Fold a piece of green construction paper in half. Then open it and cut it along the folded line. 2) Put the two pieces together, and fold them in half again. 3) Draw half a Christmas tree on the opposite side - the white surface of one fold. Cut along the line to get two identical tree shapes. 4) Fold the tree shapes in half, just barely creasing the center line to mark the center of the tree. 5) Make a slit along the lower half of the center of one tree shape. Cut another slit along the upper half of the center of the other tree. 6) Pass one tree shape through the slit of another. Tape the bottom and top portions of the trees together using clear tape. Taping in this way will enable the tree to stand up well and stop the slit ends from foundering. 7) For decorating your tree, use crayons, markers, glitter glue or tempera paint. Glue on tiny construction paper decorations or star stickers. You can also cut out tiny paper balls using a hole punch and add them on to your tree. Now you have a splendid Paper Xmas Tree ready for use. Place it on your mantlepiece or on a windowsill on Christmas Eve and make your friends wonder at your skill.